Tynecastle club reveals new away strip as it announces new merchandise partnership. Hearts have announced a new kit deal with German sports giants Adidas. The Tynecastle men will wear the brand’s three stripes from next season after their existing deal with Umbro expired. 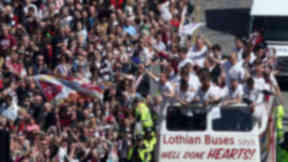 Hearts described the agreement as a “long-term partnership” to make the club’s playing, training wear and replica merchandise. The length of the contract and its worth to the club has not been announced. The Edinburgh side made the announcement as it revealed a new white and maroon away kit, which will go on sale next week. Welcoming the news, managing director David Southern said: “We are delighted to welcome Adidas, whose credentials are second to none.